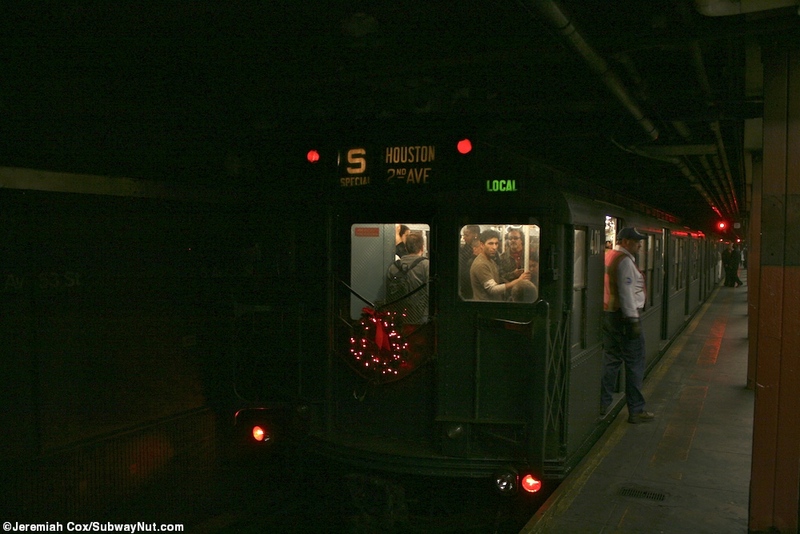 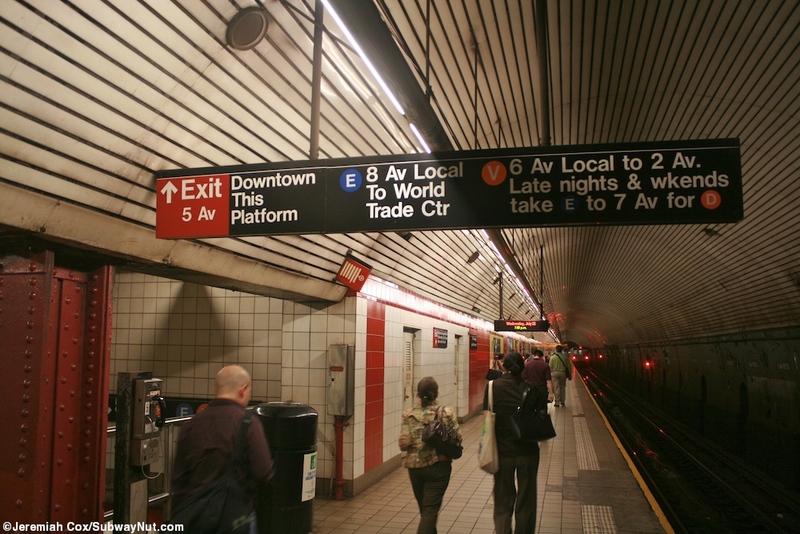 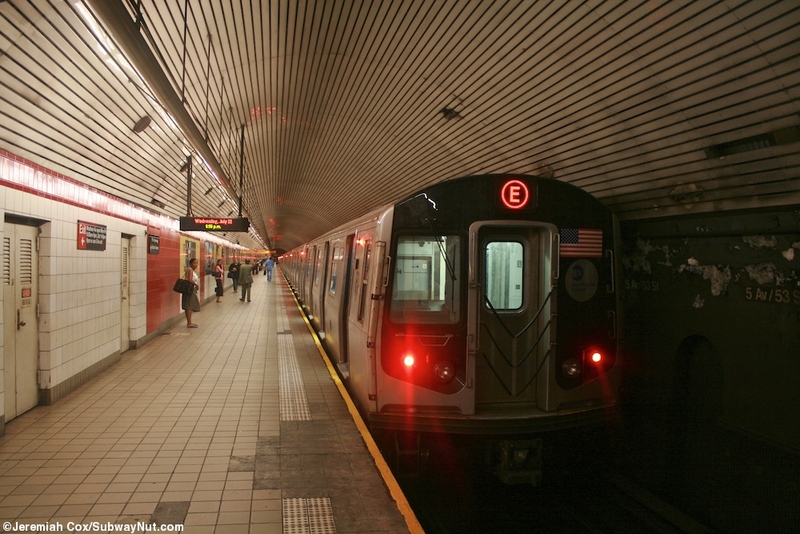 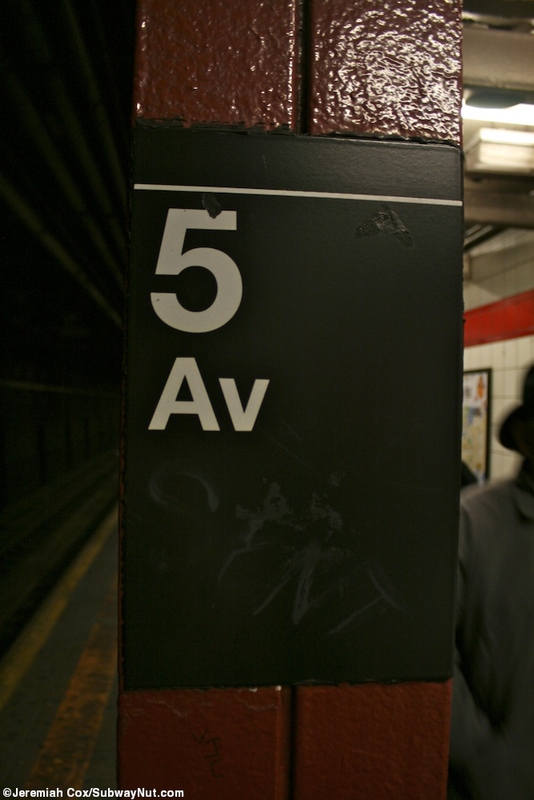 5 Avenue/53 Street is a deep level subway station with the two platforms, one for each track in each direction stacked on top of each other with the downtown platform above the uptown one. 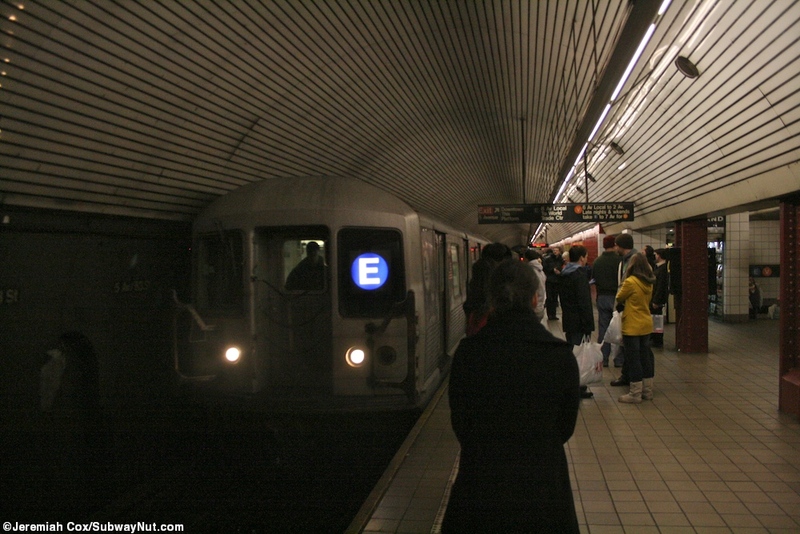 The downtown platform is one of the more elegant looking subway platforms and feels like one (along with the escalators down to it) that could be found in London, it has an arched ceiling covered in a metallic finish and no columns except to provide access to the stations two exits at either end. 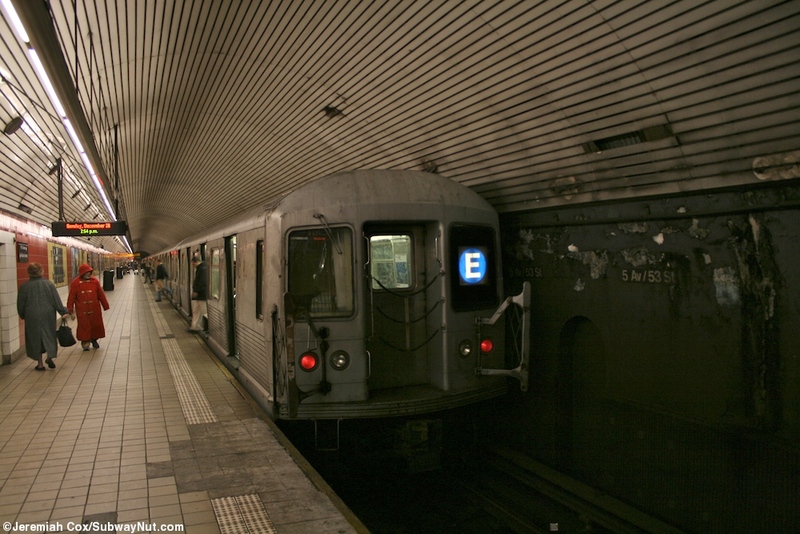 It is one of the best places (plus the stops on the Archer Avenue extension) to photograph E (and formerly V) trains underground nesters for their entire routes. 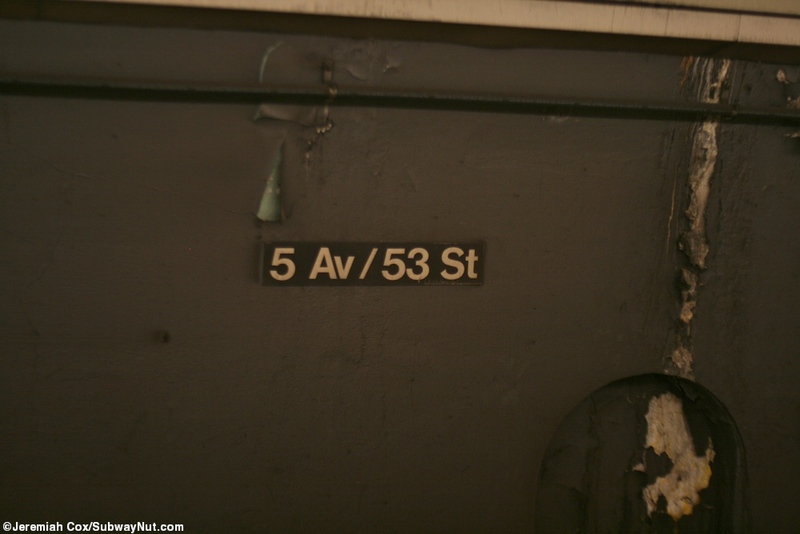 The walls (along with those of the uptown platform beneath) have an orange colored trimline with 5 Avenue/53 Street written directly along it. 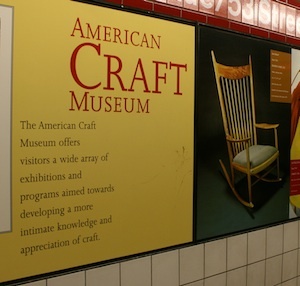 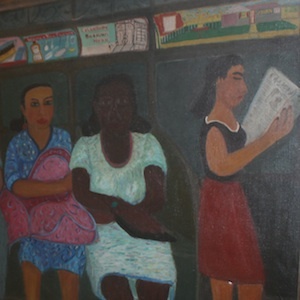 Beneath it are exhibition panels with pictures and information about the various museums in the station's area (it is the stop for MoMA). 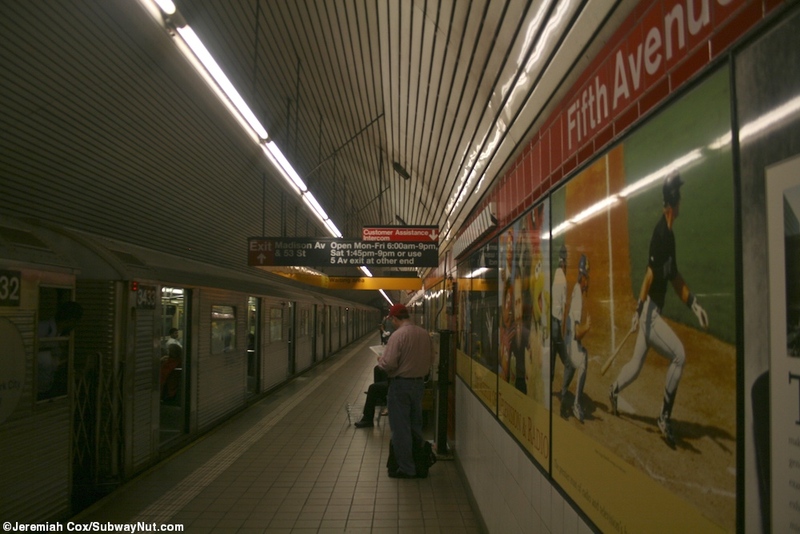 The uptown platform beneath just has advertising panels. 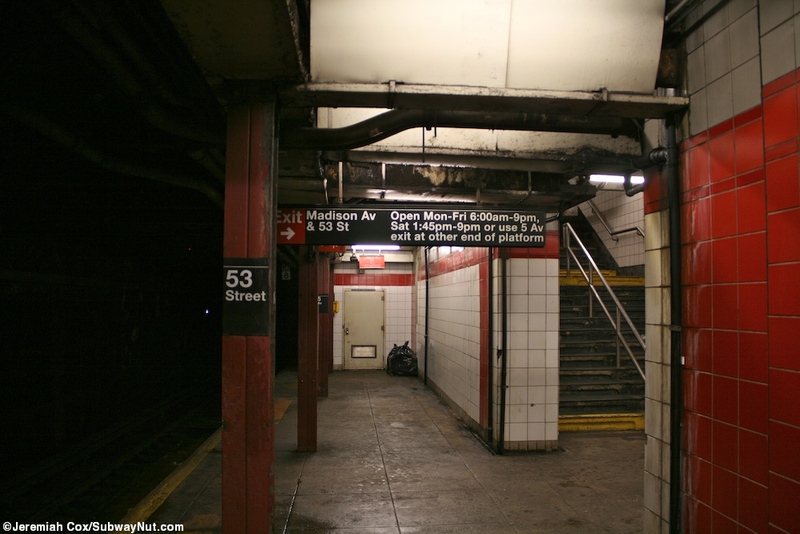 Along the walls are little 5 Av/53 St written in white along the black untitled platform walls. 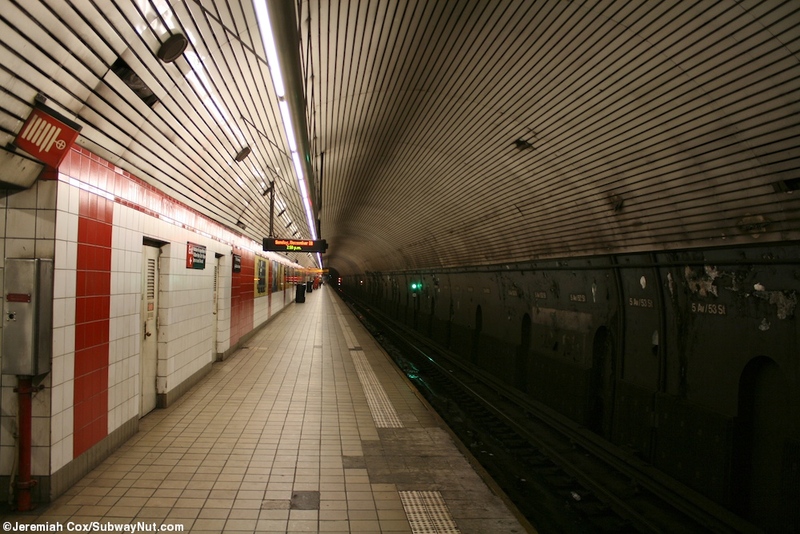 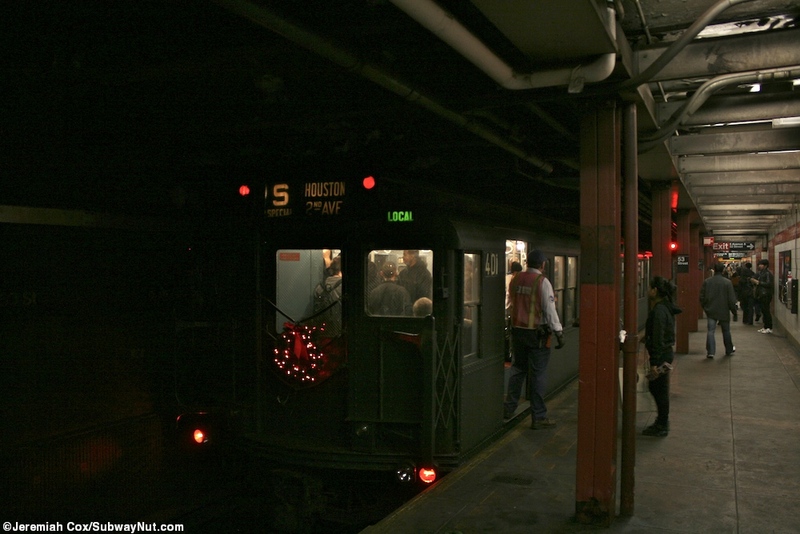 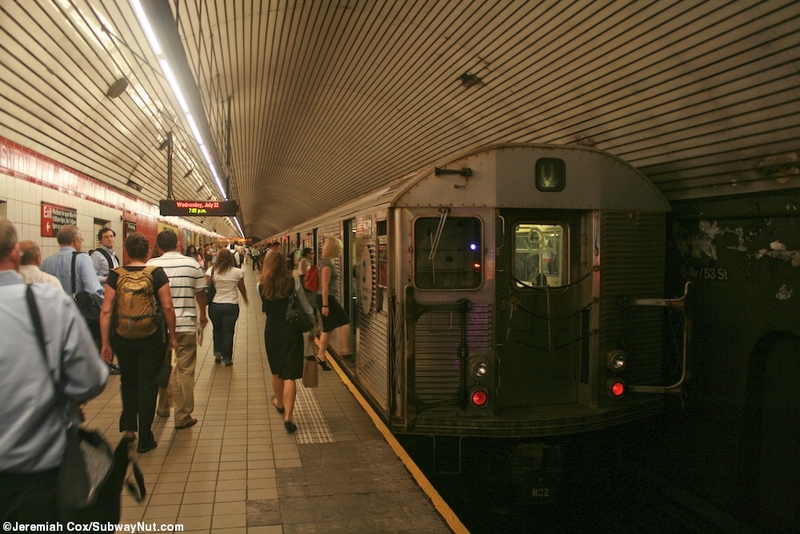 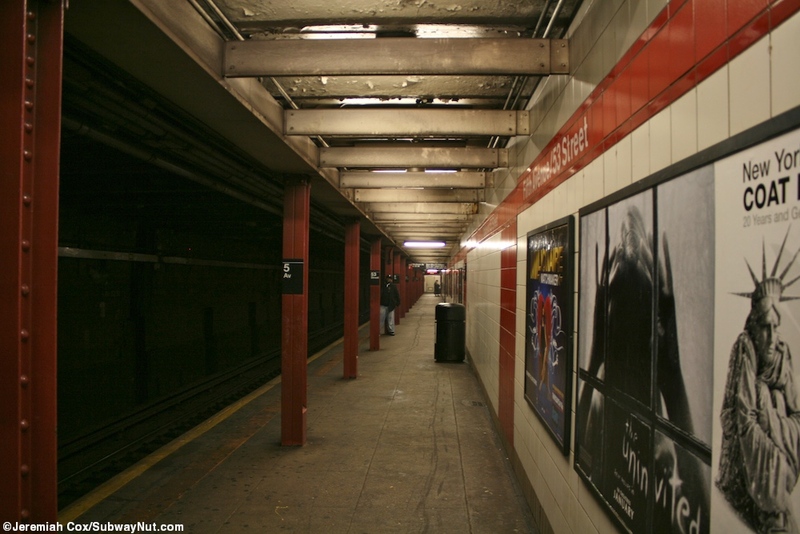 The lower level platform beneath has no arched ceiling with a platform feeling much more clostrophobic and a line of maroon columns whose sings alternate between 5 Av and 53 Street. 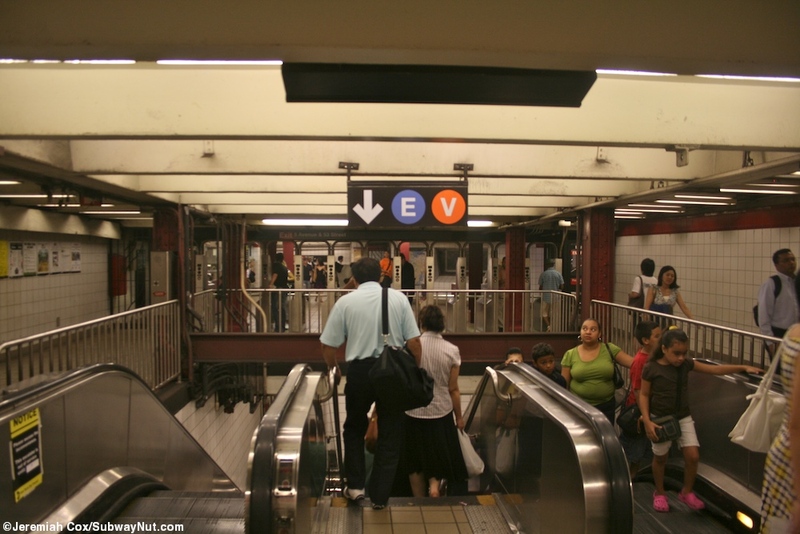 To access these platforms a staircase leads up from the uptown lower level platform to the downtown upper level at either end and these in turn (after a newsstand on the 5 Avenue end of the upper level) lead to a shaft consisting of two escalators with a narrow staircase in between to small mezzanine level fare control areas beneath 5 Avenue (full time) and the part time and Madison Avenue (open only Monday-Friday 6:00am-9pm, Saturday 1:45pm to 9pm) where passengers must double-back and walk around eitherside of the escalator landing to reach the turnstilea. 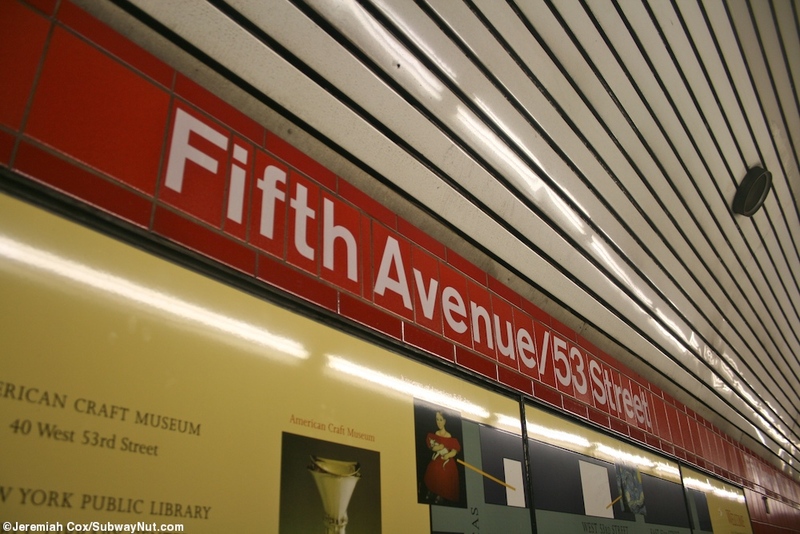 To reach the street: At the 5 Avenue end, glass doors lead to a small shopping arcade and a staircase up to 53 Street just west of the named intersection, directly across the street from MoMA. 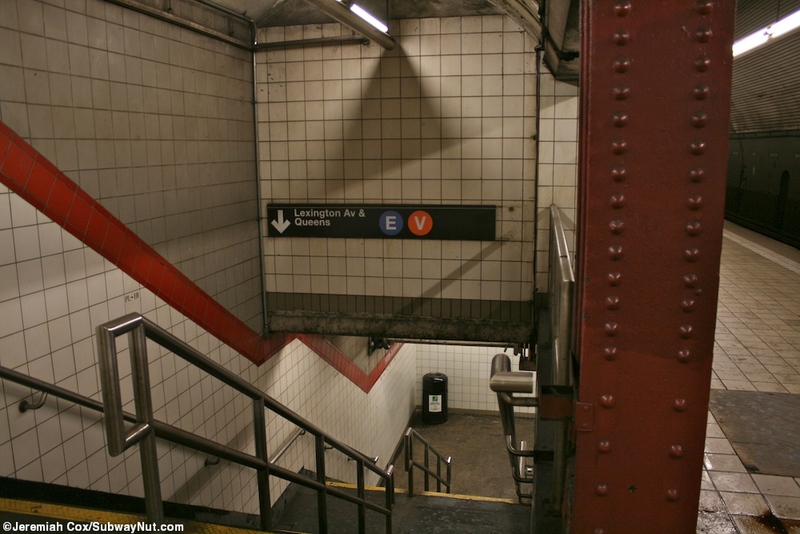 Narrow underpass type passageways with some underground steps lead beneath 5 Avenue to street stairs on 53 Street just beyond the NE and SE corners. 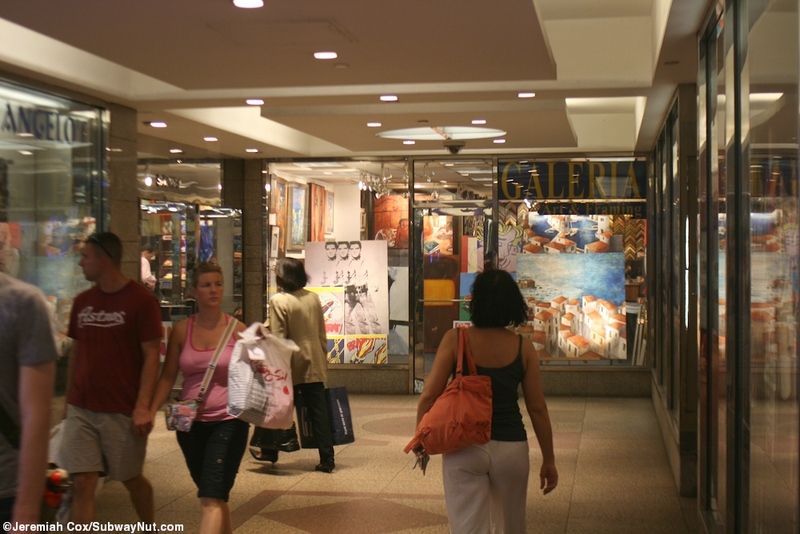 The Madison Avenue end's landing has booth the unstaffed bank of regular turnstiles and a High Entrance/Exit Turnstile for easier access to some of the passageways that lead to shopping arcade entrance (with a subway restaurant) along 53 Street inside the building on the SE corner of Madison and 53 Street and another entrance also with a few shops just across the street from it in the building on the NE corner. 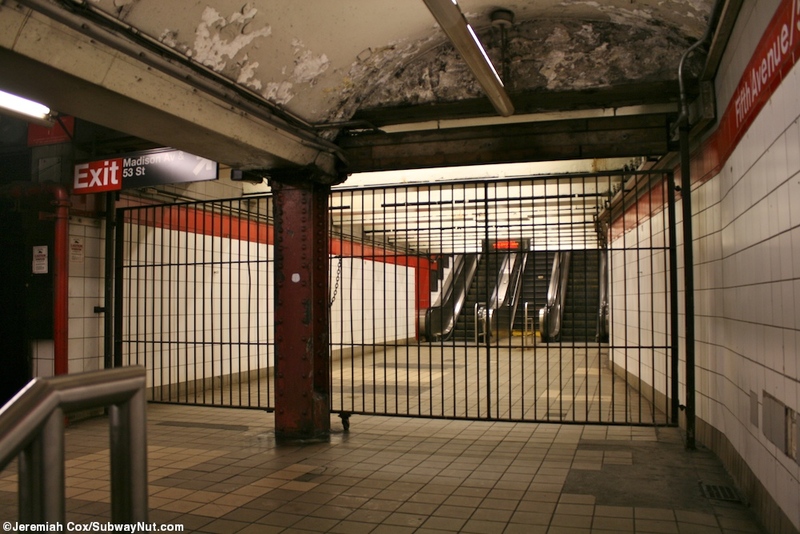 A gate closes off the escalators up to Madison Avenue since it is closed on Sundays. 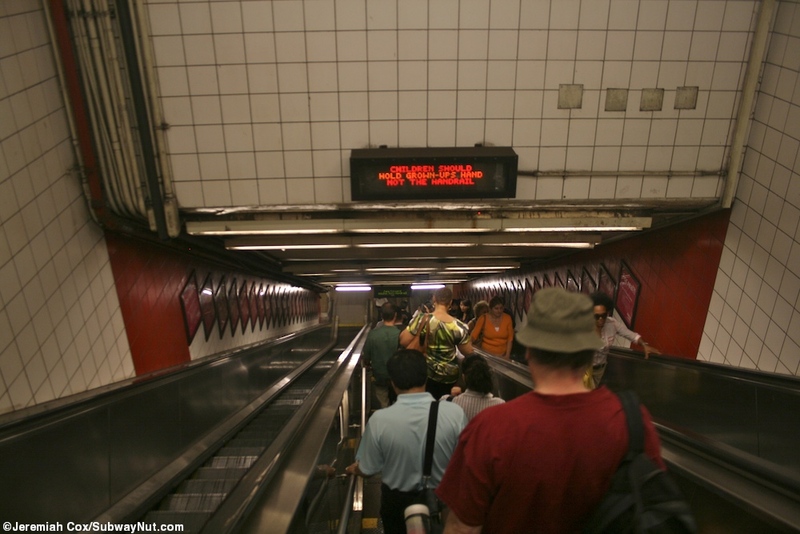 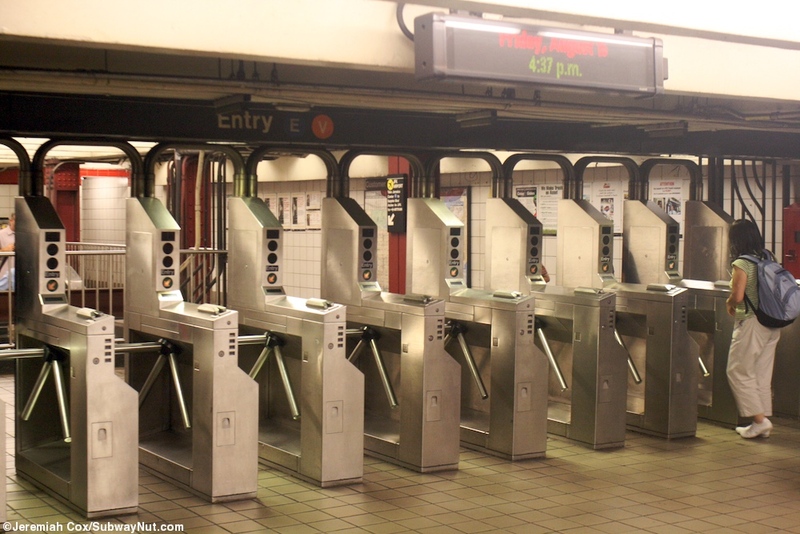 These types of part-time of entrances, common ten years ago are now increasing rare due to automation and turnstiles not needing to be staffed.